I love Victory's Golden Monkey. 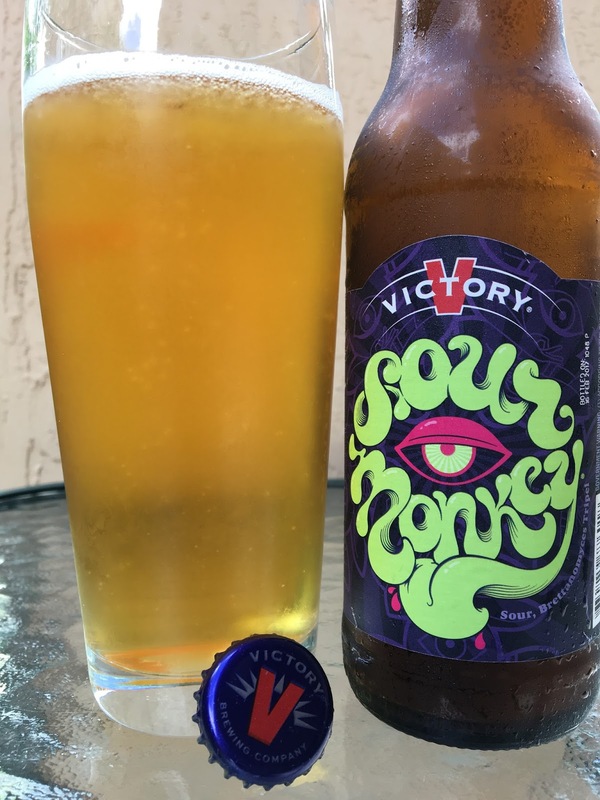 Today I'm checking out Victory Sour Monkey. I bought it several months ago, as I've been procrastinating that sour alteration. This beer is a "Tastefully Tart Twist" on Golden Monkey based on being brewed with Brettanomyces. Bottled on 16FEB2017. 9.5% alcohol. Fruity, lemon, sweet and sour aroma. Rich fruity sweet jam flavors come first, full of orange. Then a wave of Brett sourness washes those flavors away, quickly fading. Lemon, citrus, tangy, wine, acidic. Repeat. Golden Monkey with a definite twist, one I'm not really a fan of. I guess if you love Brett sours, you'd love this. Alcohol also stands out, I think more that in the original because of the acidic and sour enhancement. Anyway, not my thing. Do what ya like!